Biennial ‘Vibrant Gujarat Global Investors’ Summit” is being organized since 2003 for fostering development in Industrial and Social Sector through promotion of investments and collaborations in Gujarat. Since Vibrant Gujarat Global Investors’ Summit 2011, Education Sector was included as one of the development sectors. International Universities Conclave (IUC) 2019 aimed to foster Academic Collaborations through Internationalizations, Promotion of R & D and Innovation and Skill Development among National & International Universities on 18 January 2019. It was exhilarating to host an International level conclave at PDPU. It was graced by Hon’ble Education Minister of Gujarat – Shri Bhupendrasinh Chudasama and Hon’ble Minister of State, Primary & Higher Education – Smt. Vibhavariben Dave. It hosted senior officials from various International Universities. Seminar on ‘Global Opportunities and Career Prospects’ was held on October 27, 2017. The esteemed guest for the seminar was Ms. Kristen Savoley, delegation from the Brandeis International Business School accompanied by Sanjeev Nair, Regional sales and marketing manager at EduCo and BipinKhanduri from Uni connect. Prof. Nigam Dave introduced the delegation and shared a few lines on the importance of such sessions for the students in this phase of career conflict. Ms. Kristen was invited to give the students an overview on the business school. She talked about their student profiles, the Alumni network, their thriving International community and how the university and the school have steadily risen in the world rankings. She also talked about how the school prepares exceptional individuals from around the world to become principled global professionals and also how their community is rooted in purpose, guided by their founding values, poised to lead in education and research. Afterwards, there was an interactive session with the audience. The lecture concluded with a broad exchange of fruitful ideas. The American Citizen Services department of the U.S. Consulate, Mumbai, conducted a Townhall Event for U.S. citizens in Gujarat. PDPU hosted the event aided by volunteers from the School of Liberal Studies. American citizens were provided information on visa and related queries and e-voting for the 2016 elections. There were American food stalls and a separate craft area for children, followed by lunch. Some faculty mentors and students shared their experience at the International Exposure Program, USA. Other guests from the U.S. Consulate included Ms. Amanda Tollefson, Vice Consul, American Citizen Services, Mr. Daniel Fenech, Deputy Chief - American Citizen Services, U.S. Consulate General and Ms.Deepa Mehta, Consular Assistant. Consul General Thomas Vajda had an informal meeting with PDPU higher authorities prior to the event and talked about PDPU’s U.S. collaborations. On October 18th, 2016, PDPU hosted dinner ceremony for participants of Vibrant Gujarat’s International Conclave on Higher Education. The conclave’s aim was to align present Indian education to global standards. Discussions were held to discuss a way forward for government, academia, industry, thought leaders and student community. After parallel session on education quality, governance and innovation, a Diwali celebration was held in PDPU followed by a short cultural event was organized by students, followed by dinner. The guests included Shri Bhupendrasinh Chudasma, Hon’able Cabinet Minister, Government of Gujarat and Shri Prakash Javadekar - Hon’ble Minister of Human Resource Development, Government of India. What is the Global CEO Conclave? Over the years, the Vibrant Gujarat Global Summit has evolved into one of the most dynamic knowledge-sharing and networking platforms for global business seekers looking to identify emerging opportunities and trends. This year the Government of Gujarat has planned India's first Global CEO Conclave during Vibrant Gujarat Global Summit to drive a futuristic vision for India. This event will bring together the crème de la crème of global corporations and distinguished luminaries for thought-provoking discussions on the strategies for India's growth with Narendra Modi, Honorable Prime Minister of India. On January 11, 2015 at PDPU the reception and interaction among the distinguished participants of the conclave took place. The event was graced by the Honorable Prime Minister of India, Mr. Narendra Modi along with the then Chief Minister of Gujarat, Smt. Anandiben Patel and Honorable Finance Minister of India, Mr. Arun Jaitley. The UN Secretary General, Mr. Ban Ki Moon was the special guest along with the US Secretary of State, Mr. John Kerry. It was exhilarating to have Gujarat be the host to an international level conclave which comes at par with Davos or The World Economic Forum. It was a powerful start to the event with the welcoming of the esteemed Chairman of PDPU, Dr. Mukesh Ambani, who was welcomed by enthusiastic student volunteers. Mr. Deepak Parekh, the Chairman of HDFC bank, was also present. The likes of Adi Godrej, Gautam Adani, Sunil Mittal ,Chanda Kochhar and Deepak Parekh are among the many who helped in making the event further energized. The attendees and our Prime Minister discussed ideas with the aim of faster growth of our country. It was an event that displayed to our citizens and the rest of the world that India’s objective is to rise on a global level. With the advent of globalization and economic liberalization, nation states are growing more enlightened about collaborative efforts in all human endeavors; concern is raised for the growing inequalities also. An African proverb says, “It takes a whole village to raise a child.” Likewise entire academic world across and beyond borders need to join hands to create holistic learning experience for the contemporary student or a researcher. Pandit Deendayal Petroleum University (PDPU) has vision and commitment to be an internationally renowned and respected institution. Conscious initiatives have been taken by the university to orient its students and faculty to be global leaders. To complement the process of internationalization, PDPU is also committed to host international faculty and students on campus for shorter and longer durations. As a part of this commitment, PDPU has partnered with “Generation Study Abroad” Initiative of Institute of International Education (IIE), New York. To understand best practices prevalent in Internationalization of Indian higher education in India and to understand quality parameters from Institute of International Education (IIE), PDPU hosted stakeholders from academia, industry and government to brainstorm on Study India Program in a two days workshop on November 27th & 28th, 2015. The workshop was mentored by Prof. P J Lavakare, Former Head & Senior Advisor, Institute of International Education (IIE), India and Prof. Kirtana Thangavelu, Director, Study in India program at Central University of Hyderabad. PDPU hosted the delegation from University of Pardubice in Czech Republic on 20th February,2017 . The delegation consisted of 8 students and 1 faculty member (Assoc. Prof. Martin Fárek, the Head of the Department of the Study of Religion at the Faculty of Arts and Philosophy) from the visiting university. As a part of their visit to PDPU, OIR arranged one interactive session (workshop) for PDPU students. The abstract of the workshop session was "Can we talk about superstition in India?" -By Associated Professor Martin Fárek, University of Pardubice, Czech Republic. Mr. Bob Dudley, CEO, BP Worldwide was the Guest of Honor in Last Convocation of PDPU in 2013. Subsequent to his visit, PDPU has initiated discussion with BP India for their involvement in further development of PDPU development. BP India has kindly consented for this purpose. In this connection, two days workshop for “Industry Institution Collaboration” was conducted by Cambridge University, UK on 27-28 January, 2016 for PDPU Faculty Members sponsored by BP India. Presentation by PDPU on the workshop intent, expectations and outcomes. A visual record of industry-academic collaborations to date. Capture key learning points for assisting with the current situation and into the future. Use of selection criteria (agreed during prior stage) to aid the selection of the most interesting collaboration opportunities. Group work will explore the prioritized collaboration opportunities to develop ‘topic roadmaps’, identifying enablers, barriers and potential gaps in the current portfolio. Key actions for moving forward will be agreed. The workshop was a grand success wherein senior officials from PDPU, BP and Cambridge University participated. It provided a global platform for stakeholders to discuss ideas, prepare road maps and list down Key Performance Areas for the group to move forward. It is expected that the workshop has paved a way for strategic roadmap for long-term relationship between BP and PDPU. MIT India Lab team organized “Design Innovation” Workshop from January 17 to January 23rd where 28 Faculty members from MIT, USA participated as Faculty Mentors. One of the major activities of Office of International Relations (OIR) is to help create a synergy between industry and academia through roundtables. The purpose of the roundtable discussion groups is to provide a venue for communication and collaboration among educators, researchers, industry, Government and advocates focused on increasing bilateral relations between Gujarat and the concerned nation. The anticipated outcomes are to gener­ate research concerns based on the real needs of the classroom; to understand practical needs of education practitioners; and to collaborate planning between researchers and educators on how studies can be designed and conducted in authentic settings to inform educational practice. The roundtable has heterogeneous mix of attendees and panellists and has been arranged to create and discuss richest possible variety of interests, voices, and expertise. OIR has been successful in organizing roundtables with leading industry experts and academic institutions. PDPU hosted the Fulbright-Nehru International Education Administrators Roundtable on March 23, 2017. The seminar provided opportunities for U.S. university administrators to attend meetings with representatives of Indian universities, private-sector agencies and organizations and selected government agencies. U.S. administrators had the opportunity to familiarize themselves with program designs, organizational structures, quality assurance procedures and credit and degree expectations in Indian higher education. Participants had gained first-hand knowledge of a cross-section of Indian institutions and met with high ranking university administrators and public sector officials who played key roles in the planning and administration of higher education in India. The seminar aimed to achieve a balance of topical discussion, knowledge sharing, experiential excursions and exposure to societal/cultural facets of India. PDPU hosted Australian federal Minister for Trade & Investment, the Hon Andrew Robb and his delegation Mr. Peter Varghese- DFAT Secretary; Mr. Patrick Suckling-High Commissioner; Ms. Nicola Watkinson-Senior Trade Commissioner; Mr. Mark Pierce- Consul General; Mr. Gareth Simpson- Advisor to the Trade Minister; Mr. Cameron Hill - Advisor to the Minister; Ms. Cassandra Horton - Advisor to the Minister on 10th January, 2015. Specific MoU of Short term International exposure program for School of liberal studies students was signed between Professor Joe Chicharo, Dy. Vice chancellor of University of Wollongong and Dr. Nigam Dave, Dean School of Liberal studies. Also, MOU on cooperation to establish research scholarship at UoW was signed between PDPU and UoW. Students who had participated in 2014 International Exposure Program at University of Wollongong shared their International exposure program experience at UoW Campus. 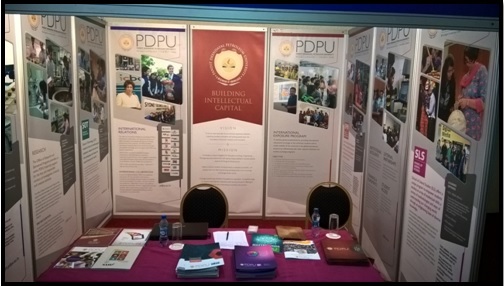 "Study in India" was a two-day education fair (February 12-13, 2016) that took place in the conference hall of "Hilton Hotel Nairobi" in Kenya was aimed at informing interested candidates about study opportunities in India. The fair was officially opened by High Commissioner H.E. Ms. Suchitra Durai of India in Kenya. About 15 different Universities participated and promoted their education mission at the fair to provide attractive choices to Kenyan students for academic value addition and accelerated career progression. 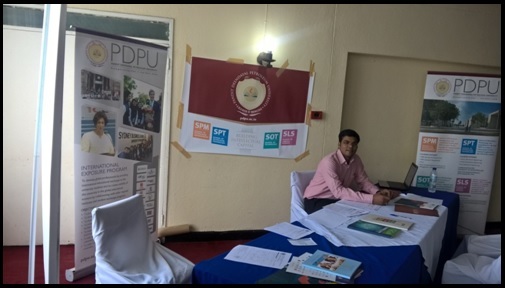 The objective of participating in the EdCIL "Study in India" campaign is to recruit the international students, develop a strong presence in Kenya, make relation with the recruitment agencies and service providers, and to achieve this objective PDPU had sent two representatives Mr. Atul Chakrabarty and Mr. Rohit Mishra to attend the EdCIL exhibition. There are 15 universities/institutes who participated in the EdCIL exhibition below are the list of universities/institutes and PDPU was the only university who offers courses in petroleum engineering which give an extra advantage above other universities participating in the exhibition. Other participating universities/institutions included mostly from South India. Philmack Consultancy organize a series of educational exhibitions 'Study in India 2016' in major cities of Zambia - Lusaka, Ndola, Kabwe, Kitwe and Chingola. The exhibitions took place from March 28 to April 2 2016 and were both highly effective and popular with the visitors in major cities. The objective of participating in the Philmack Consultancy's "Study in India" campaign is to recruit the international students from Zambia and develop a strong presence in Zambia and to achieve this objective PDPU had sent two representatives Mr. Atul Chakravarty and Mr. Rohit Mishra to attend the exhibition. There were 5 universities/institutes who participated in the exhibition below are the list of universities/institutes. Most of the participant universities/institutes were from north India. Two members of delegation from PDPU Dr. Nigam Dave & Mr. Kishlaya Misra visited Universities in Canada and US in September, 2015 for 2 week duration from 13th – 22nd September to explore long term and sustainable knowledge partnerships. These officials interacted with representatives from 8 Universities, academic institutes and research organizations - Institute of International Education, Sacred Heart University, Washington & Jefferson College, Memorial University, Brock University, University of Saskatchewan, University of Alberta and University of Alberta.